Okay, so you might think it’s impossible to create an informative essay outline in under a minute—but it’s really not! Here’s what you need to know: an outline just tells the story of your essay in a bare bones format. Think of a book or film you like. How would you describe it if you were on a bus and had only 10 seconds to tell another person heading for the door what it was all about? Maybe you’d say something like this: Boy meets girl. Boy falls in love with girl. Girl moves away. Boy goes to war. Girl sees boy’s picture in newspaper, sends boy letter. Boy and girl re-unite. Guess what? That’s a basic outline of a story—and it only took 10 seconds. 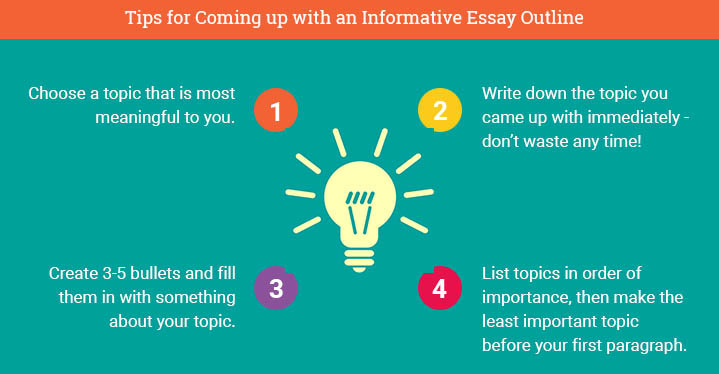 So believe us, you can easily create an effective informative essay outline in under a minute! Here are 5 steps to follow that will help you do just that! List the topic points in order of importance, with 1 being most important and so on. Save the most important topic item for your last body paragraph and you’ll be sure to go out with a bang! Voila! You’ve just created a basic informative essay outline in no time at all! Add an introductory paragraph and a concluding paragraph and you’re all set. In a little while, we’ll look at an example of how to do all this. For now, let’s take our basic outline and flesh it out by plugging in all the important parts. Congratulations! You’re on your way to writing a great informative essay! P.S. Coming up with a topic maybe a little difficult, so we have provided a bunch of informative essay topics to help guide you. I. The first thing to do with your informative essay outline is to identify the goal of your paper. What is it you will be explaining? This will serve as the focus of your paper. Once you have that, you will know how to proceed. II. Give your paper a smart title—something that really calls to the reader. Make it snappy or creative. Give it some oomph! Titles are a good way to hook a reader from the get-go. III. Consider your audience. What age group or background is your reader likely to have? What do they already know about the subject? IV. Identify the purpose of your paper. Write a directive at the top of your outline—something like: The purpose of this paper is to inform my audience of…. V. The introductory paragraph should begin with a HOOK. A hook is what draws the reader in: it catches the audience just like a fish hook catches a fish. To sweeten up the hook, add a little morsel to it. For example, if you’re informative essay is about the electric car industry, you can lead off with a quote from TESLA founder Elon Musk, or provide some insight about how the future of driving is in the battery-powered vehicle. Come up with something that is attention-grabbing. Think of headlines that impress you, and try to achieve the same goal. VI. The introductory paragraph should also include an explanation of what the essay will show. This can be summarized near the end of the intro so that the reader understands exactly what is to follow. VII. The body paragraphs will follow. Each body paragraph should consist of a main point, supported by details. Three body paragraphs are typically sufficient for fleshing out the essay in a standard 5-paragraph model. VIII. A conclusion paragraph should wrap everything up. It re-iterates the main point of the essay and summarizes the details. ii. Conclude the paragraph with a summary that includes a transition to the next thought—i.e. the second paragraph. ii. Conclude the paragraph with a summary that links back to the two preceding thoughts covered in the other body paragraphs. Now let’s look at a sample outline to help you get started! Step 1: What do I care about most? Thinking…okay, 10 seconds are up! Step 3: List topic items that define the subject. 5. Like to enjoy their free evenings whenever possible! Step 4: Rank in order of most important to least. Step 5: Reverse the order so that the least important is first and the most important is last. Perfect! Now we have a great set-up for writing an informative essay about being a real estate agent. Let’s use the outline template provided above to flesh it out! a. Hook: Have you ever wondered what it’s like to be a real estate agent? You may know how to become one—but what is it like once you are licensed? b. Purpose of Essay: This paper will give you information about what a single day in the life of an agent is like. c. How it will proceed: First, we’ll look at how real estate agents typically spend their mornings. Second, we’ll see how their afternoons usually go. Finally, we’ll describe an average evening for the real estate agent. a. 1st body paragraph: Mornings are spent scouting for clients. i. Agents have to make lots of phone calls to connect with their client base. 1. They will call old friends, call old acquaintances, call old contacts, and go through their database routinely in order to keep in touch with everybody. 2. Keeping their names fresh in the minds of potential buyers is how they attract business. ii. They must block out time to do this and usually morning is the time when they are least busy. iii. Once the afternoon arrives, it is off to the races. b. 2nd body paragraph: Afternoons are for showings. i. In order to sell houses, they have to show houses. ii. That means getting potential buyers inside homes for sale. 1. Buyers typically like to see a range of houses before selecting the one for them. 2. Agents, therefore, have to show lots of houses before the right one can be found. 3. They will schedule back to back to back showings all day long if they have to. 4. Their job is to match the right buyer with the right home. iii. This takes up most of the afternoon—so by evening time, agents are ready for a break. c. 3rd body paragraph: Evenings can go one of two ways. i. Evenings can be spent relaxing at home. ii. Or they can be spent pitching listing presentations to potential sellers. 1. It’s a toss-up: what does the agent need to do more—relax or focus on securing a potential seller to represent? 2. After all, in order to get listings, agents have to show sellers why they should be hired to represent them. It’s a lot of work putting in a presentation. iii. So whether the agent is still working at night or relaxing, it is—all in all—a very busy day, with mornings consumed by reaching out to contacts and afternoons spent showing properties! III. Conclusion: A real estate agent has a very busy life! a. Summarize the main idea of the essay: Agents are always on the go. b. Touch upon the main points that you want the reader to take away from the essay: They work from morning till night: they make contact with old clients and with potential new ones; they show houses throughout the course of the day to prospective buyers; and they make listing presentations to prospective sellers. It is never a dull moment for a real estate agent. In fact, this is just the tip of the iceberg—there’s a lot more to learn, too! To sum it all up, your informative essay outline doesn’t have to take a lot of time to work out. In fact, it’s all just waiting in your head—ready to spring out as soon as you give it the right tap. You can create an effective outline in under a minute. Simply follow the steps provided here. Get a pen and pad of paper ready. Find a quiet spot. Clear your mind, relax, and then think about your favorite subject. Don’t question yourself—just write down the first thing that comes to your mind. No hesitation! Now it’s time to move! Quickly jot down the first 3 to 5 topic items that immediately leap to your mind when you imagine yourself describing this subject to someone about to get off a bus. You only have a few seconds—so what would you say? Write down those topic items and then rank them in order of importance. You do this because when it comes to writing the essay, you want to save the best items for last: it gives your essay a type of climax towards which it can build. Once you have your items, you are on your way. All you have to do now is plug everything in to the basic essay outline template provided above. Give your essay a good title and the rest is history! See how simple it is? Remember: The key to developing a strong outline is you: spend a little bit of time being honest with yourself. Think about what subjects you like, care about, or know a lot about. The more you believe in yourself, the easier it will be to identify the things you are most confident about explaining. The subject that you know best is the one that you should most want to write about. Let it happen and the rest will come easy. "How to Create an Effective Informative Essay Outline." Aceyourpaper.com. Student Network Resources Inc, 11 August. 2017. Web. 18 April 2019. Student Network Resources Inc. "How to Create an Effective Informative Essay Outline." Aceyourpaper.com. 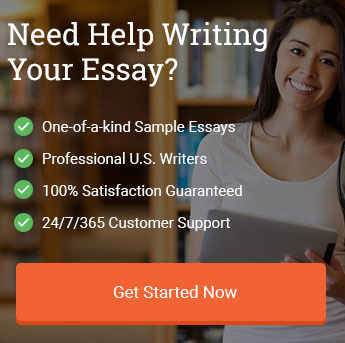 https://www.aceyourpaper.com/essay-writing/informative-essay-outline/ (accessed April 18, 2019).